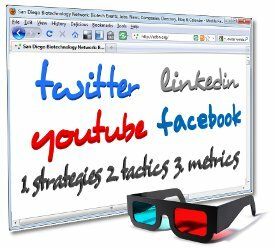 You’ve put together your overall life science social media strategy (if not, see Workshop 1 and our other social media training) and it includes third party applications such as Twitter, LinkedIn, Facebook, and YouTube. How do you use these applications to reach out to your customers effectively? The applications are all different, requiring individual strategies, tactics, and methods for determining metrics. Join us August 31st in San Diego or via the web to learn the ‘Rule of 3’s’ for third party social media, and you’ll start reaching out to your customers like never before (almost like a 3D movie, you could say). What strategies and themes work with life scientists? Which third party social media applications are my customers using, and how do I target them there? How do I fulfill corporate goals and provide value at the same time? How can I get the most out of my time spent on 3rd party social media? What are the best tips and tools for each application? Where can I find the content I need? How do I get direct leads from 3rd party applications? How can I quickly understand the etiquette for each application? How do I measure success using external and internal metrics? My management still doesn’t understand the value of third party social media applications–how can I convince them? This workshop is now available as an on demand webinar lasting 3.5 hours, see the workshops and training page for more details. Printed materials will be mailed to you, so there may be up to a one week waiting period. Register here and contact us with any questions.